When a team wins back-to-back championships, their tickets are simply going to be desirable. 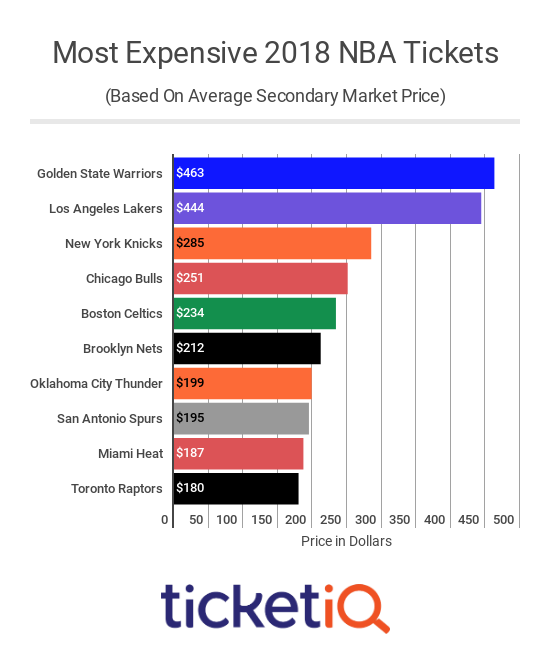 For the fourth year in a row, the Golden State Warriors have the highest average secondary market ticket price; it’s risen by about 2% this year to $463. 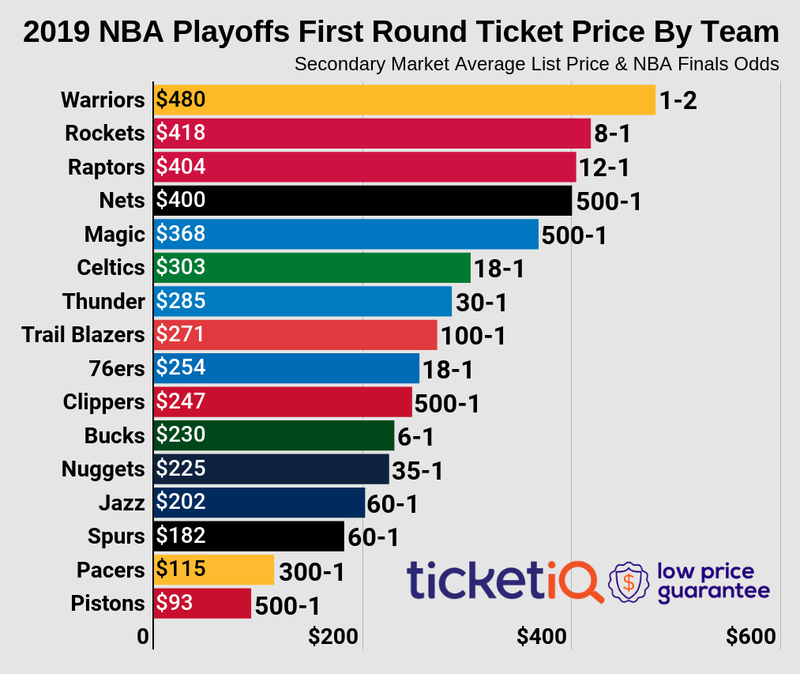 Right behind them are the Los Angeles Lakers with their new addition of LeBron James, who has single-handedly boosted their ticket prices to an average of $444. Beyond the two California clubs, no other teams’ average price breaks $300. 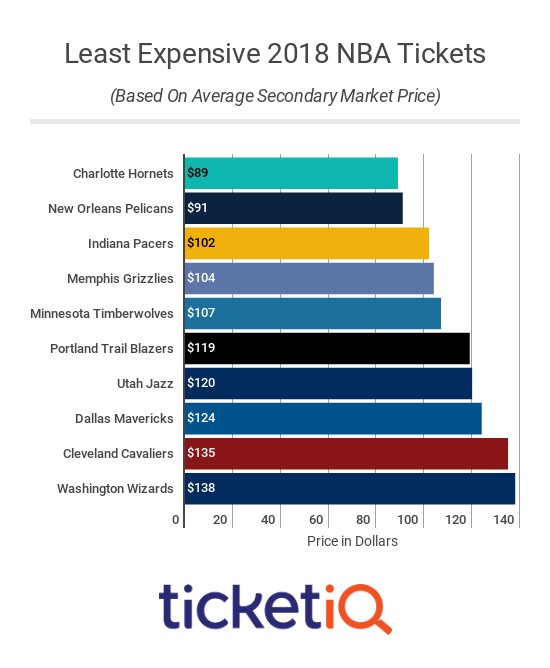 Unsurprisingly, the Charlotte Hornets and the New Orleans Pelicans are at the bottom of the barrel in terms of secondary market price, averaging $89 and $104 respectively. Both teams missed the playoffs last season and will face an uphill climb to change that this year. The Minnesota Timberwolves, Portland Trail Blazers, and Dallas Mavericks round out the bottom five. Both Minnesota and Portland will likely be in the hunt for a playoff spot, so there could be some value to be had in those markets. 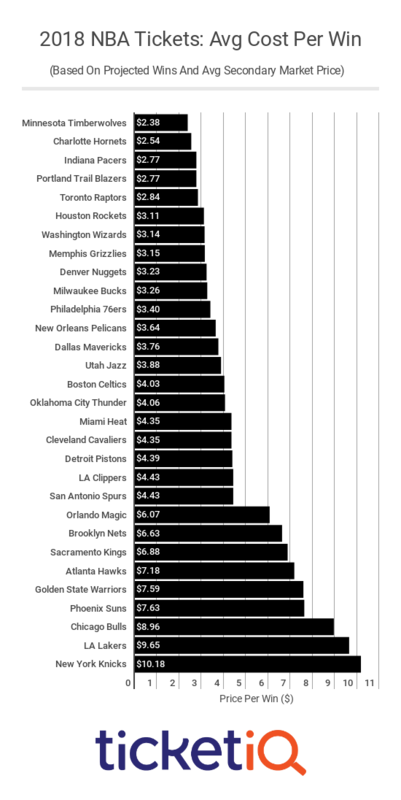 The NBA is a league driven by stars and the most expensive games reflect that reality. The 11 most expensive games on the secondary market either feature Steph Curry’s Warriors or LeBron James’ Lakers. The two games when the two teams meet in Oakland clock in with massive average prices; they currently sit at $1768 for the Christmas Day showdown and $1378 for a February faceoff. You’ll have to pay nearly $250 just to get in the building for either of those dates. Based on each team’s average ticket price on the secondary market and ESPN’s season projections, we can determine each team’s value in terms of dollars per win. Looking at those stats, there are plenty of good deals to be had; the highlights include several playoff teams—the Indiana Pacers, Houston Rockets, and Toronto Raptors—towards the top of the list. On the opposite side of the spectrum, you’ll be paying a premium to see the struggles of New York Knicks. LeBron James is arguably the NBA’s biggest name and his fingerprints are all over the secondary ticket market. After his departure from the Midwest, Cleveland Cavaliers tickets plummeted by an average of 42%. 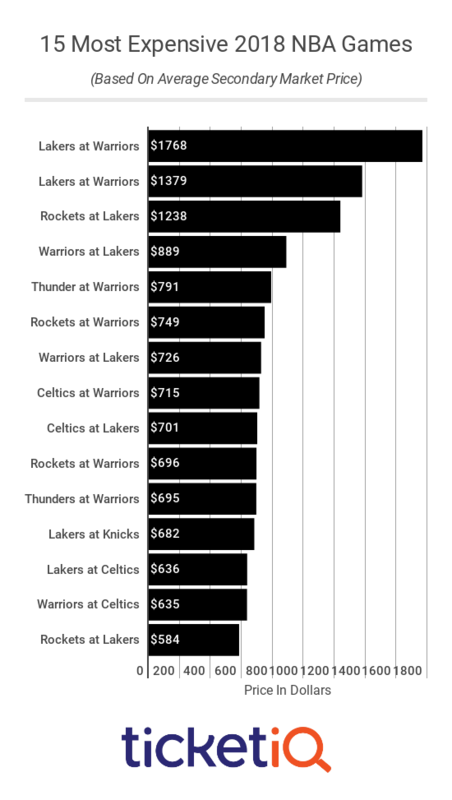 On the opposite side of the country, Los Angeles Lakers tickets rose by 48% per game. 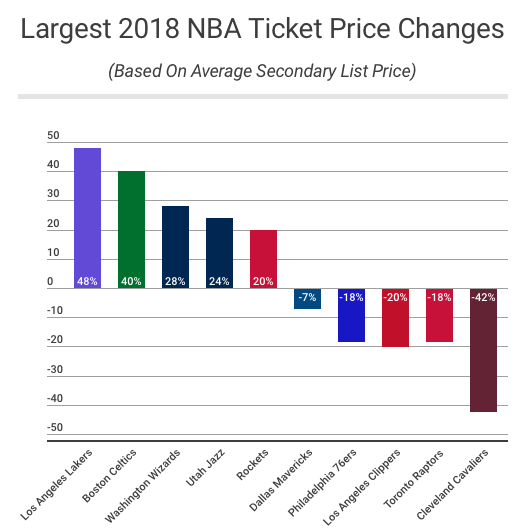 Outside of LeBron’s shadow, now might be the time to look into Toronto Raptors tickets; their secondary market fell by 29% despite their 207-18 success and addition of Kawhi Leonard. During the 2017-18 NBA season, only nine teams averaged 100% attendance. Combine that with the fact that the league lacks a uniform entry policy—most teams will accept mobile tickets, but some will only accept tickets on specific apps—and the primary ticket market may be your best bet this season. But no matter which market you’re shopping on, there are plenty of great deals for the upcoming NBA season if you know where to look. Since 2011, the NBA has claimed Christmas Day as an opportunity to showcase the best the league has to offer. This year’s schedule features five games: the Milwaukee Bucks at the New York Knicks, the Philadelphia 76ers at the Boston Celtics, the Oklahoma City Thunder at the Houston Rockets, the Portland Trailblazers at the Utah Jazz, and the Los Angeles Lakers at the Golden State Warriors. In terms of a bargain, the game to circle on the calendar is Oklahoma City and Houston. ESPN projects the Rockets and Thunder to be the second and fourth place teams in the Western Conference, respectively, but you can score seats for half of the price of the mediocre Knicks-Bucks match-up. The average secondary market price for a ticket at Vivint Smart Home Arena is $220 and the cheapest available seat is $75; you’ll have to pay at least $184 on the secondary market to get into Madison Square Garden. The highlight of the day, however, is undeniably the Lakers’ visit to the Warriors. 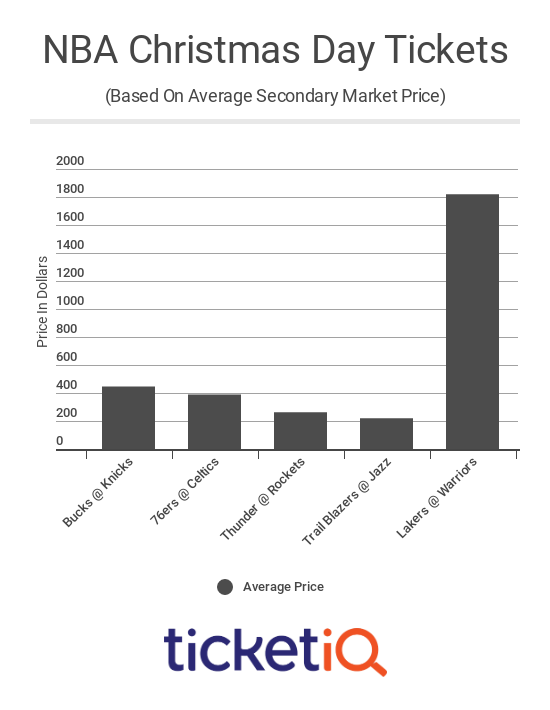 Understandably, the secondary market prices are sky high; the average resale ticket price currently sits at $1,820, while the get-in price is $248. Both of those rates are the highest ever for a Christmas Day game.